After School Club is a 4 week program for children in grades 3-5. Each week we will read a different book, eat snack and have activities related to that week's book. The “I Don’t Believe in Magic” Magic Show, it is up to Presto Pete and the audience to convince Chris that magic does exist. Ages 4 and up. Free tickets available at the library beginning April 1st. The Yo-Yo Guy is an interactive performance with yo-yos, unicycle and a giant yo-yo that will amaze you! Ages 4 and up. Free ticket available at the library beginning April 1st. Meet live animals, including a South American paca and hear interesting stories and information about them. Ages 4 and up. Free tickets available at library beginning April 1st. The program will feature performances by SRL Irish Dance Studio's talented students, history and information about Irish dancing, and a free mini-lesson for all ages. Join us for Wreck It Ralph Breaks the Internet (rated PG) on the big screen. Front lobby doors will open at 6:00. Movie will begin at 6:30 pm. Bring blankets and pillows. 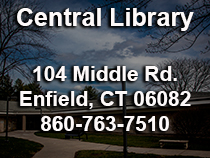 Come find out what your library has to offer you and your children. Sign up your child for our next session of Storytime. 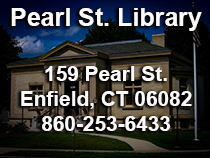 Storytime schedule is available here. Come count down to the Noon Year with us! Join us for an hour long celebration as we count down to twelve o'clock noon. All ages. Co-sponsored by Enfield Plays On. Design a picture that glows. Incorporate LED lights to make your design shine. You bring the imagination and we will provide the rest. Learn about electricity, conductivity and circuits while creating a one of a kind piece of art. Ages 7 and up. Registration required. In this family-friendly, acro-comedic act, Matica Arts will perform acts of daring and tremendous skill. Witness with awe extreme unicycling, club juggling, and more. Audience participation is a must. Ages 4 and up. Free tickets available at the library starting December 17th.